OXFORD, Miss. — It’s finally time to come home. The Ole Miss faithful will gather this weekend in Oxford, Mississippi for the 2018 home opener against the Salukis of Southern Illinois. Kickoff is set for 3 p.m. (CT) on September 8 in Vaught-Hemingway Stadium. This will be the third time in history for the two programs to face one another. The Rebels won both of the two previous meetings, with the most recent victory (2011) ending in Ole Miss’ favor, 42-24. Ole Miss, coming off a well-earned 47-27 victory against Texas Tech last Saturday, is preparing to face a much more run-heavy offense in the Salukis, as opposed to the “Air Raid” style of play the Rebel defense faced against the Red Raiders. Offense: Southern Illinois is also coming off an impressive victory, defeating the Murray State Racers on the road by a whopping score of 49-10. The Salukis finished the game with 446 total yards of offensive, with much of that production coming from the run game. 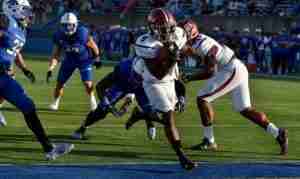 Leading the Salukis’ running attack is junior running back D.J. Davis, who finished the day with a respectable 127 yards on 19 carries. They also were not hesitant to play their other productive running backs, senior Jonathan Mixon and redshirt freshman D.J. Hampton, who combined for 75 yards and a touchdown. During Wednesday’s post-practice interview, Ole Miss head coach Matt Luke addressed the pressing need to stop the run. “We’re going to play a lot of teams that are going to get into big personnel and try to run it at us,” he said. SIU Defense: The other big story for Southern Illinois, besides the strong performance in the ground game, was the three defensive touchdowns scored by the Saluki defense in their blowout win: a 23-yard fumble return by sophomore safety Qua Brown, an interception in the end zone by junior linebacker Airan Reed, and a 73-yard fumble return by freshman safety Michael Elbert. Three scores ties the school record for most touchdowns by a Saluki defense in one game. As far as yardage goes, the Southern Illinois defenders only allowed the Murray State offense to tally 87 yards on the ground and a total of 285 yards. When asked about the SIU team as a whole on Wednesday, Coach Luke emphasized the need to take the Salukis very seriously and to exercise great caution in their playmaking ability. “They got six turnovers in the last game, three for touchdowns,” Coach Luke said of the defense the Rebels will face Saturday. Coach Luke also described the offense the Landshark D will face in The Vaught Saturday. “Offensively, they do a good job of mixing personnel,” he said. “They’re a smash-mouth team. They’ll take their deep shots,” he noted. Ole Miss offense: On the other side of the field this weekend are the Rebels of Ole Miss. Coach Luke’s team is coming off a very impressive win in a neutral site match against the Red Raiders. The Rebels’ offense shined–as many in the college football world thought it would–gaining nearly 550 yards, while senior quarterback Jordan Ta’amu threw for 336 yards and two touchdowns in the victory. While many thought the big story was going to be the Ole Miss passing attack, it was JUCO transfer Scottie Phillips who stole the show Saturday, as he rushed for 205 yards and two touchdowns on 16 carries. It has been quite a while since the Rebel faithful have seen such a performance out of a running back on a stage as big as the one in Houston. The last time a Rebel RB notched over 200 yards, in fact, was in 2010 when Brandon Bolden accomplished the feat. Needless to say, it was a pleasant surprise for Coach Luke. “The word I’ve been using is cautiously optimistic, because I’ve seen a lot of really, really good things in the spring and in fall camp, but it was good to see him,” Luke said of Phillips. “He has short, quick bursts, but he also has the breakaway speed that he can finish it when he breaks the line so really, really pleased to see him have some success,” he added. The notorious N.W.O. (Nasty Wide Outs), as the Ole Miss receiving corps is called, were back on their regular path of destruction with four Rebel receivers breaking the 60-yard mark against Tech. DaMarkus Lodge finished with 6 receptions and a team-leading 96 yards. A.J. Brown caught a team-high 7 passes for 93 yards and one touchdown. D.K. Metcalf tallied 4 catches for 81 yards and a touchdown, and Braylon Sanders caught 4 for 60 yards. On the day, Ole Miss receivers combined for 336 yards. When asked after Wednesday’s practice if the Ole Miss offense is “a dream” for the wide receivers, sophomore Sanders simply responded with a resounding, “Definitely.” He also made it clear the receiver group is a tight-knit “family,” eager to help each other out whenever necessary. “They teach me everything,” Sanders said of the Rebels’ standout receivers. “With just different techniques to use, here and there, just little things,” he added. Despite starting the season at what appears to be full speed, the Ole Miss offense continues to work hard on its craft every day in order to remain the best unit in the nation. Ole Miss defense: On the flipside of the ball, the Rebels’ defense made big strides in the win over Texas Tech. Although they gave up 486 total yards to the Tech offense, the Landsharks were able to make key stops on third and fourth downs throughout the course of the game, emphasizing a “bend, don’t break” mentality. There were many impressive performances on the defensive side of the ball. However, arguably the most impressive of the bunch was that of junior defensive back Montrell Custis. With seven tackles, one of which was for a loss, and four pass breakups, Custis was a nice surprise for an Ole Miss defense that had lacked the ability to consistently stop big plays in 2017. Landshark D mainstays Zedrick Woods and C.J. Moore, along with linebackers MoMo Sanogo and Detric Bing-Dukes, helped lead the defense, as well as facilitate better communication within the unit. In Monday’s weekly presser, defensive coordinator Wesley McGriff stated the importance of communication within the unit. “The communication was key. Our kids were on the same page most of the time,” he said. Saturday’s game against Southern Illinois should be a good second test for the Rebels’ run defense given the fact that the Salukis prefer to run the ball quite a bit in between the tackles. 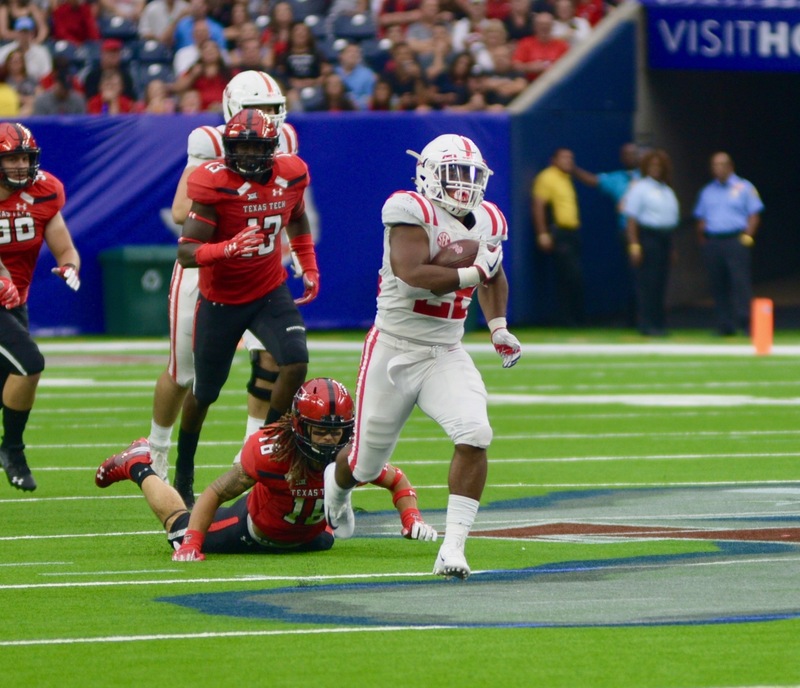 In the season opener, the Rebels’ front four made its presence known, with Josiah Coatney, Quaadir Sheppard, and Benito Jones all recording tackles for loss. Also adding to the production inside were Ross Donelly and Tariqious Tisdale who are prepped to add solid snaps to the Landshark defense. Stopping the Salukis’ run game will offer a different challenge than the Ole Miss defense saw against Tech. After Tuesday’s practice, linebacker coach Jon Sumrall talked about the task at hand in stopping the Salukis run game. “[Texas] Tech’s run game is unique. They try to get you in one-on-one situations, Sumrall said. As far as injuries are concerned, Coach Luke stated on Wednesday that freshman linebacker Kevontae’ Ruggs is listed as “doubtful” to play on Saturday as he is still moving through the concussion protocol. DaMarkus Lodge is more likely to play, Luke said, though the senior wide receiver is also in the concussion protocol. Running back Eric Swinney remains sidelined after being diagnosed with mononucleosis. Coach Luke stated he has been given an estimate of three weeks for Swinney’s return to play; however, he also explained that there is no way to predict exactly when the RB will be able to return. At Wednesday’s practice, running back Scottie Phillips did not dress out. Media was told that holding Phillips out was purely precautionary, and he is expected to play Saturday. Sadly, cornerback and kick returner Jaylon Jones, who returned a kickoff 94 yards for a touchdown Saturday, will miss the remainder of the season, following the torn ACL he suffered against the Red Raiders. Jones will have surgery Friday. Overall, the Rebels are ready to get back on their home turf to welcome Southern Illinois into the Vaught. When asked after Wednesday’s practice about the team’s first home appearance Matt Luke described the emotions involved. Ole Miss fans, small and tall, are more than ready to pack into the Vaught Saturday afternoon, eager to see their Rebels play. If you cannot make it to Oxford for the game, you can catch the action on the SEC Network Alternate channel at 3 p.m. (CT). Hotty Toddy and Go Rebels! Fins Up!